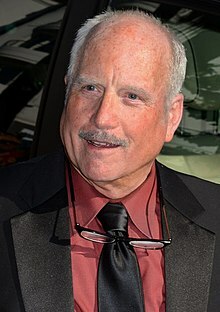 Richard Stephen Dreyfuss (born October 29, 1947) is an American actor, television actor, and stage actor. Dreyfuss was born on October 29, 1947 in Brooklyn, New York to Norman Dreyfuss, a lawyer, and to Geraldine Dreyfuss, a peace activist. Dreyfuss was raised Bayside, Queens, New York. Dreyfuss and his family first moved to Europe, because his father dislike New York City. Later they moved to Los Angeles, California when he was just 9 years old. He was educated at Beverly Hills High School. His career began during the late 1960s and had appeared in movies such as; American Graffiti, Jaws, Third Encounters of the Third Kind, The Goodbye Girl, Whose Life Is It Anyway?, Always, What About Bob?, Poseidon, Mr. Holland's Opus, and James and the Giant Peach. Dreyfuss has won an Academy Award for Best Actor in 1977 for his role in The Goodbye Girl and was nominated for another Academy Award for Best Actor in 1995 for his role in Mr. Holland's Opus. He has won a Golden Globe Award, BAFTA Award, and in 2002 he was nomination for a Screen Actors Guild Award. Dreyfuss was married to Jeramie Rain from 1983 until it ended in divorced in 1995, they had three children. Later he married Janelle Lacey in 1999 until they divorced in 2005. He is currently married to Svetlana Erokin since 2006. They currently live in Carlsbad, California and in Encinitas, California. Dreyfuss suffers from bipolar disorder. In 2006, he appeared in Stephen Fry's documentary Stephen Fry: The Secret Life of the Manic Depressive, which documented Stephen Fry's life with the disease. ↑ Owen, Jonathan (September 17, 2006). "Stephen Fry: My battle with mental illness". The Independent. ↑ Stephen Fry: The Secret Life of the Manic Depressive. BBC. This page was last changed on 27 June 2018, at 17:19.